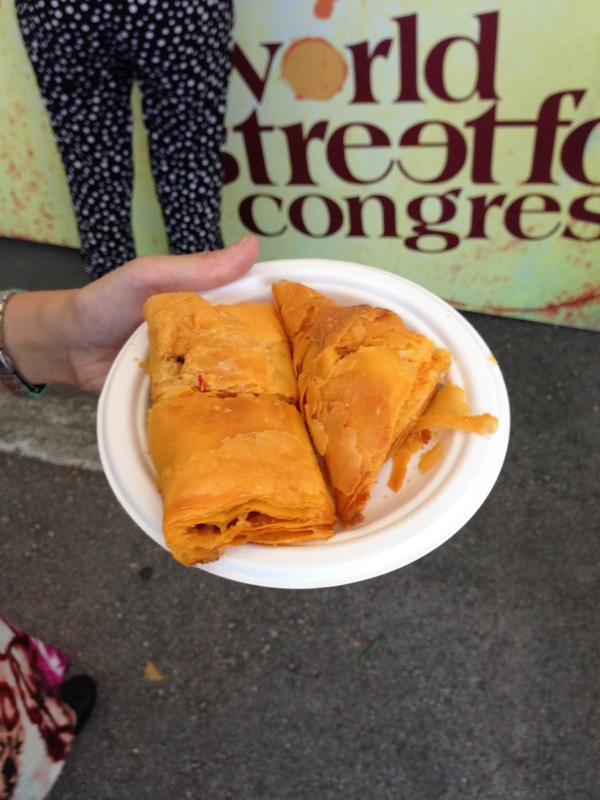 Expat Kiwis: World Street Food Congress 2013 - Makan time! The lure of food was too great at the inaugural World Street Food Congress (WSFC) 2013 in Singapore. We went at around 5:30pm, perfect time as it wasn't too crowded. Piece of advice; don't go too late, otherwise some of the food stalls actually run out of food! This can only lead to disappointment. Jamboree Pack - Your license to eat. Monopoly Money; pay for your food so that you don't need to "Get out of Jail." There were about 40 stalls there, so there is a pretty decent food selection. Various countries were represented; Singapore, Indonesia, US, Denmark, Vietnam, India etc. All were doing some favourites which Foodies should recognise and drool over. Stalls, all lined up, ready to serve. Singapore ordering style; stop, snap pic, then order. Assam Laksa; even the Dude in front, would work just to have it. So, onto the tasty bit of the blog. Here are some of the goodies we had. BBQ Prawns. The Pickles took an edge off the yummy Chilli Sauce. Vietnamese Pancakes; Banh Xeo and Banh Khot - tasty with a crispy texture. The Fish Sauce was okay too. Chicken 65; this was good with a squeeze of Lemon and dipped in the Coriander Pesto. Corn Chips and Guacamole; nothing amazing, just for snacking. Curry Puffs; Potato and Mutton flavours. Rice Flour Dumplings; came in 2 varieties, savoury (Pork) and the one with Sugar is sweet. 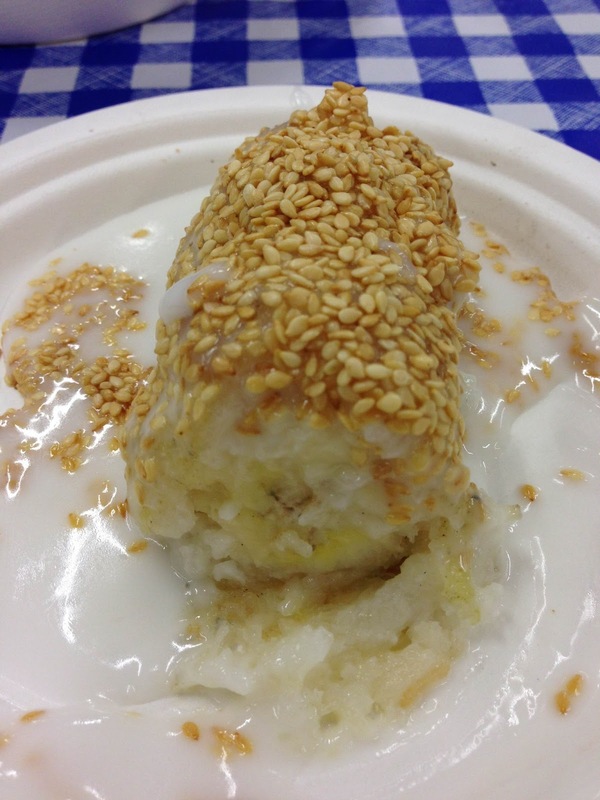 Sticky Rice Banana; BBQ'd goodness served with Sesame and Coconut Cream. Other food was consumed as well including a very good Porchetta Sandwich and Assam Laksa. It is the first time the event is in Singapore so if you're keen to try a variety of street food it might be worth checking out. Note that even with the initial vouchers you get with your tickets, the average price of the dishes were about $8 upwards with some costing as much as $14. If you went for Chilli Crab then expect $25 to $35 dollars. Be prepared to purchase more vouchers to use. We ended up getting another $50 or so in food vouchers just so that we can try more dishes. The common feedback from visitors will probably center around the high pricing; especially when in Singapore, you can get great quality street food at a fraction of the prices charged at WSFC. If you're up for a Beer; you need to use the same vouchers for this as well, it can set you back $13 for a full pint. 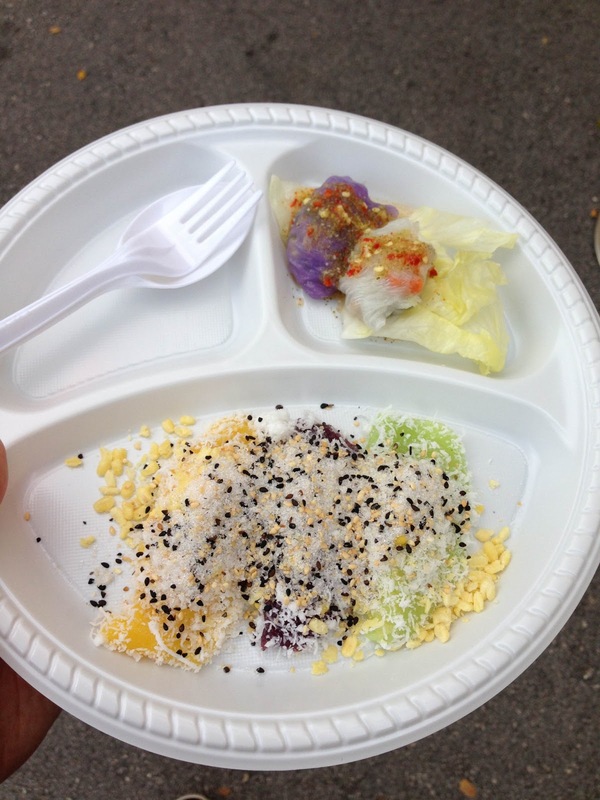 Overall, if you like street food, check it out. The food is tasty, pretty good quality, but it's street food that sure ain't at street food prices. If you're there to try the food; put the pricing aside, if you want to have a good time.